I started my second mug of coffee and decided a bit of random blogging was in order. 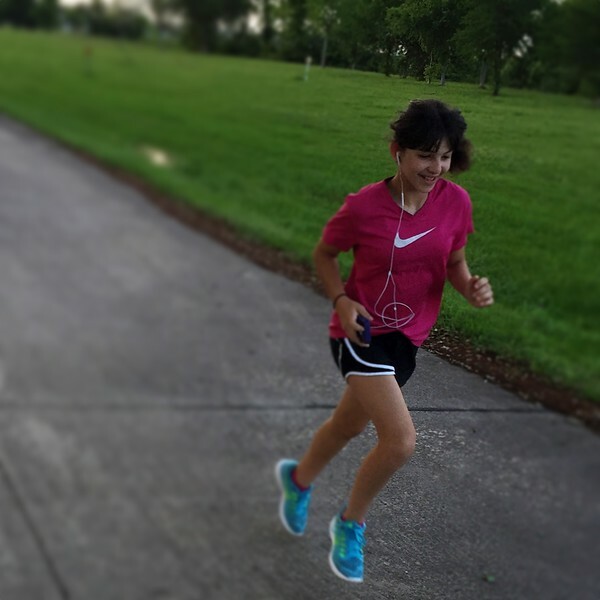 Annelise has been on a running kick recently. It's totally her doing, no prompting necessary. She got a new pair of Nikes over the weekend which led to a tester run and I guess they passed because she's gone for a run up and down our street the following two afternoons as well. She downloaded the Nike app to her iPod and she likes seeing her stats. Yesterday she made it a full two miles and was rather pleased with herself. I haven't been running in a good long while, big surprise. I toyed with the idea of trying the #58milesinapril Instagram challenge, as I've done well working toward a mileage goal in the past, but I never got going with that and now it's the middle of April (not that I couldn't still do it, but not starting closer to the beginning messes with my mind). Earlier this year I ordered two new fitness programs from Beachbody. I know, I know, did I really need new ones since we already have a fair stockpile? Apparently so. I obviously have commitment issues and figured my level of commitment would be highly improved by a bright and shiny new program. Soon after starting Pump I decided to also try Les Mills Combat (I was on a Les Mills high I guess) which is a mixed martial arts cardio and strength program. The main trainers, Dan and Rach, are AWESOME, the music is jamming, the workouts are challenging and the sweat flies, but they are doable (there's also a low impact modifier). I love it! So...all that to say I am doing a mash-up of these two programs having lots of sweaty fun. I'm not really following the calendars that came with the programs but just trying to get a balance of cardio and resistance training. In a perfect world I would workout everyday, but I'm not quite there yet, usually getting in four or five...maybe six days these last few weeks, which feels like a huge accomplishment based on my track record of zero, zilch, nada earlier this year. Scott is doing T25, except this time he's trying out the Beta phase, which technically comes after the five weeks of Alpha, but he was getting bogged down and bored with Alpha and made the executive decision to jump ahead to keep himself motivated. The fantastic thing about T25 is that it's only 25 minutes and the workouts are all challenging but fun (and there is a modifier). After Pump & Shred yesterday I tried Beta Core Cardio for the first time to get my cardio in and thought I might die. But I didn't. In fact, I kinda loved it (once I was done, of course). And that, my friends, is what's new on the fitness front around here. What's your latest fitness JAM? Do tell.